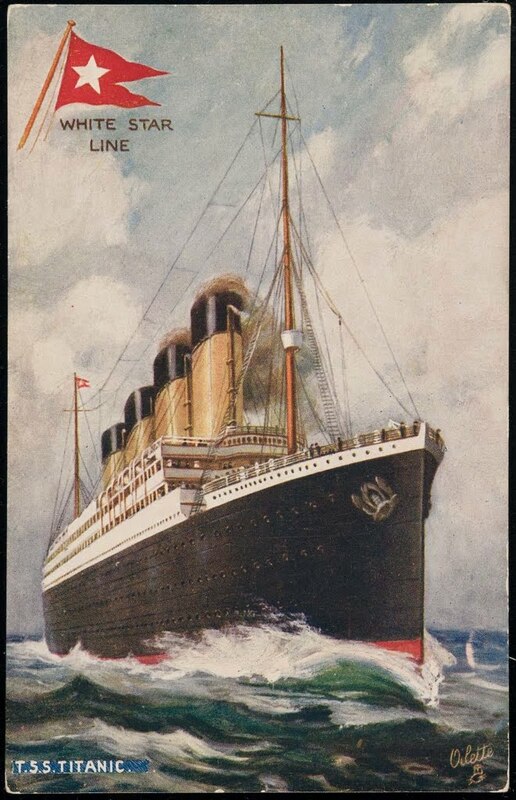 On September 20, 1911 as Olympic leaves Southampton on her 5th voyage. The navy cruiser HMS Hawke suddenly rams her on the starboard side just beneath the aft well deck. 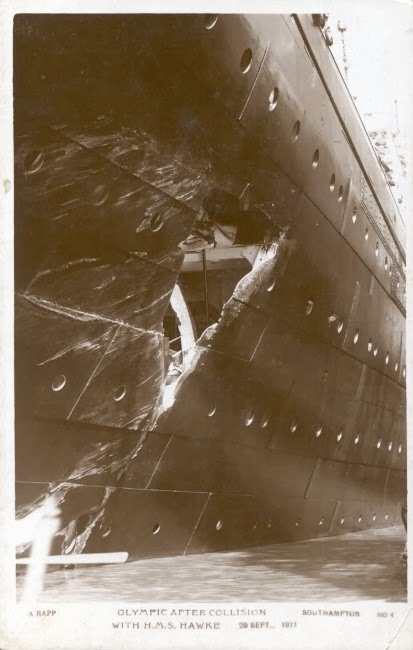 Hawke thrusts 8 feet into Olympic's hull, tearing a 40 foot gash below the water line. This caused 2 of her compartments to flood and twisted the starboard propeller shaft. 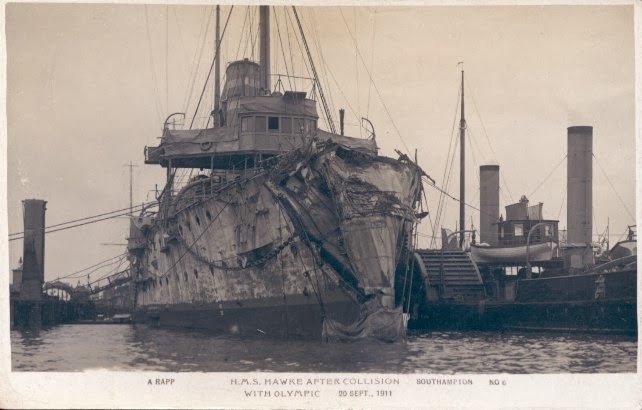 Despite the damage, Olympic returned to Southampton under her own power. Olympic was then towed to Belfast for repairs. This incident was a huge financial disaster for White Star. Not only was Olympic out of service, Titanic's construction was going to be delayed by 3 weeks. Resources were pulled from Titanic for Olympic's repairs. Borrowing one of Titanic's propeller shafts along with other materials so Olympic could continue service. The Royal Navy blamed Olympic for the accident. Stating that water displacement from the huge ship pulled the much smaller ship into it's wake. Later in February, 1912, Olympic loses a propeller blade. 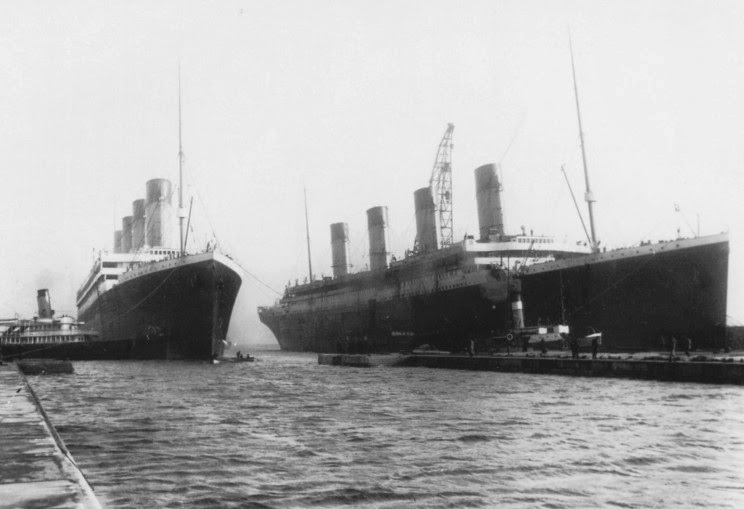 Again resources were pulled from Titanic delaying her maiden voyage from March 20th to April 10, 1912. 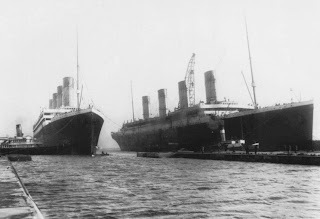 Olympic pulling up next to Titanic for repairs at Harland & Wolff. Because of the Hawke incident and other mishaps with Olympic, some suggest that the new ships are just too big. 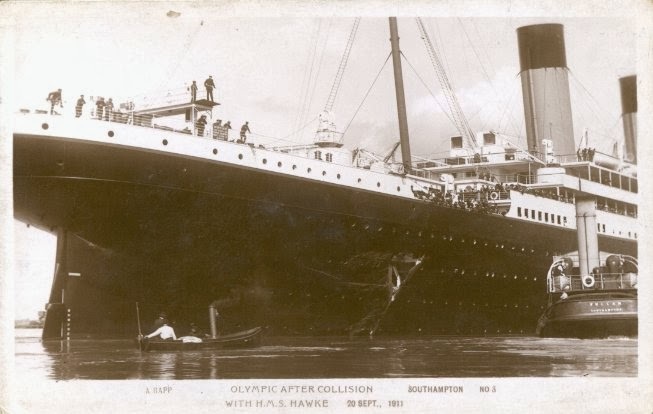 However, the collision proved that Olympic's safety systems worked, and since Olympic did not sink, this created a stronger foundation for the unsinkable theory.